Define and differentiate affect, behavior, and cognition as considered by social psychologists. Summarize the principles of social cognition. 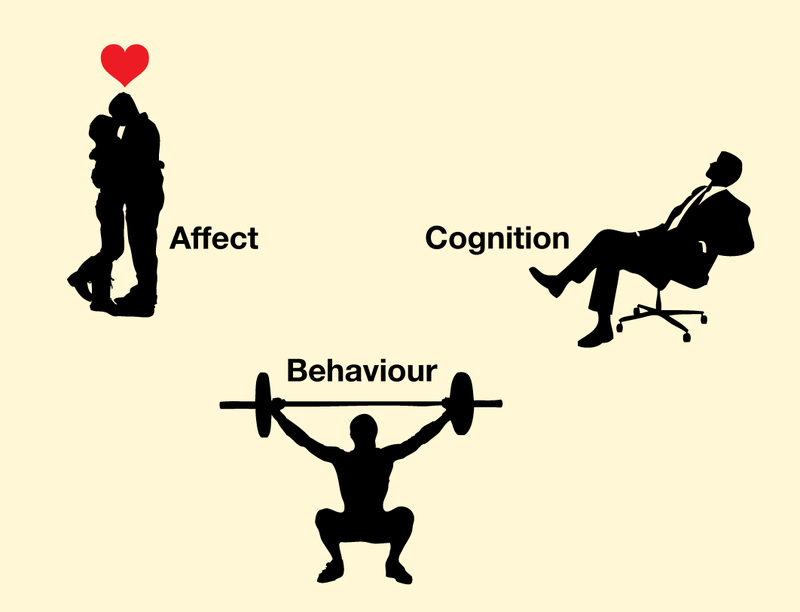 Figure 1.5 Human beings rely on the three capacities of affect, behavior, and cognition, which work together to help them create successful social interactions. You can see that these three aspects directly reflect the idea in our definition of social psychology—the study of the feelings, behaviors, and thoughts of individuals in the social situation. Although we will frequently discuss each of the capacities separately, keep in mind that all three work together to produce human experience. Now let’s consider separately the roles of cognition, affect, and behavior. The human brain contains about 86 billion neurons, each of which can make contact with tens of thousands of other neurons. The distinguishing brain feature in mammals, including humans, is the more recently evolved cerebral cortex—the part of the brain that is involved in thinking. Humans are highly intelligent, and they use cognition in every part of their social lives. Psychologists refer to cognition as the mental activity of processing information and using that information in judgment. Social cognition is cognition that relates to social activities and that helps us understand and predict the behavior of ourselves and others. Figure 1.6 The cerebral cortex is the part of the brain that is involved in thinking. 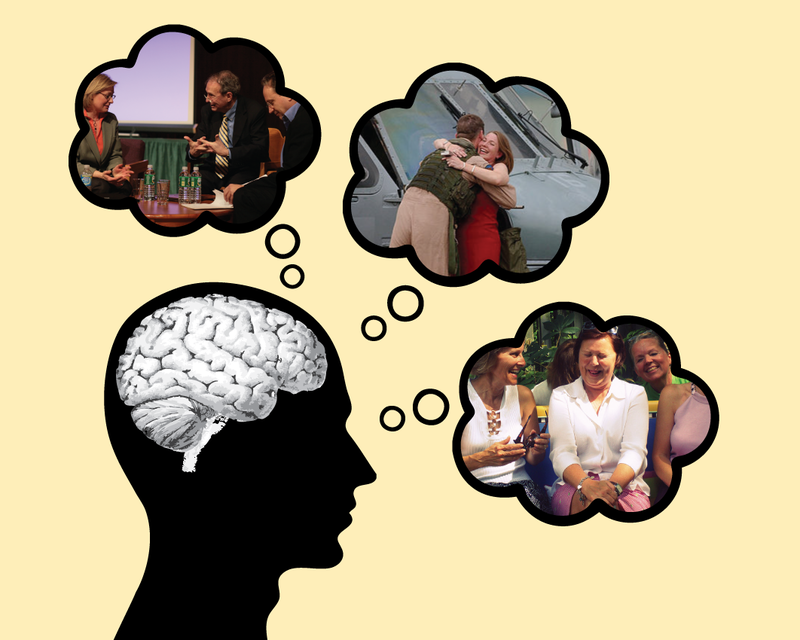 A big part of its job is social cognition—thinking about and understanding other people. to_their_home_at_Naval_Air_Facility_Atsugi_030725-N-HX866-002.jpg) by PHC(SW/NAC) SPIKE CALL in the public domain. “Panel Discussion” (http://commons.wikimedia.org/wiki/File:Panel_Discussion_Close-up,_Science,_Faith,_and_Technology.jpg) by David Bruce used under CC BY-SA 2.0 (http://creativecommons.org/licenses/by-sa/2.0/deed.en). “laughing mom friends” (https://www.flickr.com/photos/lolololori/2581438627/) by Lori used under CC BY-SA 2.0 (https://creativecommons.org/licenses/by-sa/2.0/); “Black Icon Cloud Food Outline Symbol People Man” (http://pixabay.com/en/black-icon-cloud-food-outline-24152/) in public domain (http://creativecommons.org/publicdomain/zero/1.0/deed.en); “Outer surface of the human brain” in public domain (http://en.wikipedia.org/wiki/Public_domain); “Head profile” (http://openclipart.org/detail/166375/head-profile-by-printerkiller) in public domain (http://openclipart.org/share). Over time, people develop a set of social knowledge that contains information about the self, other people, social relationships, and social groups. Two types of knowledge are particularly important in social psychology: schemas and attitudes. A schema is a knowledge representation that includes information about a person or group (e.g., our knowledge that Joe is a friendly guy or that Italians are romantic). An attitude is a knowledge representation that includes primarily our liking or disliking of a person, thing, or group (“I really like Julie”; “I dislike my new apartment”). Once we have formed them, both schemas and attitudes allow us to judge quickly and without much thought whether someone or something we encounter is good or bad, helpful or hurtful, to be sought out or avoided. Thus schemas and attitudes have an important influence on our social information processing and social behavior. Social cognition involves the active interpretation of events. As a result, different people may draw different conclusions about the same events. When Indira smiles at Robert, he might think that she is romantically attracted to him, whereas she might think that she’s just being friendly. When Mike tells a joke about Polish people, he might think it’s funny, but Wanda might think he is being prejudiced. The 12 members of a jury who are deliberating about the outcome in a trial have all heard the same evidence, but each juror’s own schemas and attitudes may lead him or her to interpret the evidence differently. The fact that different people interpret the same events differently makes life interesting, but it can sometimes lead to disagreement and conflict. Social psychologists study how people interpret and understand their worlds and, particularly, how they make judgments about the causes of other people’s behavior. Affect refers to the feelings we experience as part of our everyday lives. As our day progresses, we may find ourselves feeling happy or sad, jealous or grateful, proud or embarrassed. Although affect can be harmful if it is unregulated or unchecked, our affective experiences normally help us to function efficiently and in a way that increases our chances of survival. Affect signals us that things are going all right (e.g., because we are in a good mood or are experiencing joy or serenity) or that things are not going so well (we are in a bad mood, anxious, upset, or angry). Affect can also lead us to engage in behaviors that are appropriate to our perceptions of a given situation. When we are happy, we may seek out and socialize with others; when we are angry, we may attack; when we are fearful, we may run away. We experience affect in the form of mood and emotions. Mood refers to the positive or negative feelings that are in the background of our everyday experiences. Most of the time, we are in a relatively good mood, and positive mood has some positive consequences—it encourages us to do what needs to be done and to make the most of the situations we are in (Isen, 2003). When we are in a good mood, our thought processes open up and we are more likely to approach others. We are more friendly and helpful to others when we are in a good mood than when we are in a bad mood, and we may think more creatively (De Dreu, Baas, & Nijstad, 2008). On the other hand, when we are in a bad mood, we are more likely to prefer to remain by ourselves rather than interact with others, and our creativity suffers. Emotions are brief, but often intense, mental and physiological feeling states. In comparison with moods, emotions are shorter lived, stronger, and more specific forms of affect. Emotions are caused by specific events (things that make us, for instance, jealous or angry), and they are accompanied by high levels of arousal. Whereas we experience moods in normal, everyday situations, we experience emotions only when things are out of the ordinary or unusual. Emotions serve an adaptive role in helping us guide our social behaviors. Just as we run from a snake because the snake elicits fear, we may try to make amends with other people when we feel guilty. Because we interact with and influence each other every day, we have developed the ability to make these interactions proceed efficiently and effectively. We cooperate with other people to gain outcomes that we could not obtain on our own, and we exchange goods, services, and other benefits with other people. These behaviors are essential for survival in any society (Kameda, Takezawa, & Hastie, 2003; Kameda, Takezawa, Tindale, & Smith, 2002). The sharing of goods, services, emotions, and other social outcomes is known as social exchange. Social rewards (the positive outcomes that we give and receive when we interact with others) include such benefits as attention, praise, affection, love, and financial support. Social costs (the negative outcomes that we give and receive when we interact with others), on the other hand, include, for instance, the frustrations that accrue when disagreements with others develop, the guilt that results if we perceive that we have acted inappropriately, and the effort involved in developing and maintaining harmonious interpersonal relationships. Imagine a first-year student at college or university who is trying to decide whether or not to join a student club. Joining the club has costs, in terms of the dues that have to be paid, the need to make friends with each of the other club members and to attend club meetings, and so forth. On the other hand, there are the potential benefits of group membership, including having a group of friends with similar interests and a social network to help find activities to participate in. To determine whether or not to join, the student has to weigh both the social and the material costs and benefits before coming to a conclusion (Moreland & Levine, 2006). People generally prefer to maximize their own outcomes by attempting to gain as many social rewards as possible and by attempting to minimize their social costs. Such behavior is consistent with the goal of protecting and enhancing the self. But although people do behave according to the goals of self-concern, these goals are tempered by other-concern: the goals of respecting, accepting, and cooperating with others. As a result, social exchange is generally fair and equitable, at least in the long run. Imagine, for example, that someone asks you to do a favor for them, and you do it. If they were only concerned about their own self-enhancement, they might simply accept the favor without any thought of paying you back. Yet both you and they would realize that you would most certainly expect them to be willing to do the same type of favor for you, should you ask them at some later time. One of the outcomes of humans living together in small groups over thousands of years is that people have learned to cooperate by giving benefits to those who are in need, with the expectation of a return of benefits at a future time. This mutual, and generally equitable, exchange of benefits is known as reciprocal altruism. An individual who is temporarily sick or injured will benefit from the help that he or she might get from others during this time. And according to the principle of reciprocal altruism, other group members will be willing to give that help to the needy individual because they expect that similar help will be given to them should they need it. However, in order for reciprocal altruism to work, people have to keep track of how benefits are exchanged, to be sure that everyone plays by the rules. If one person starts to take benefits without paying them back, this violates the principle of reciprocity and should not be allowed to continue for very long. In fact, research has shown that people seem to be particularly good at detecting “cheaters”—those who do not live up to their obligations in reciprocal altruism—and that these individuals are judged extremely negatively (Mealey, Daood, & Krage, 1996; Tooby & Cosmides, 1992). We use affect, behavior, and cognition to help us successfully interact with others. Social cognition refers to our thoughts about and interpretations of ourselves and other people. Over time, we develop schemas and attitudes to help us better understand and more successfully interact with others. Affect refers to the feelings that we experience as part of life and includes both moods and emotions. Social behavior is influenced by principles of reciprocal altruism and social exchange. Consider a time when you had an important social interaction or made an important decision. Analyze your responses to the situation in terms of affect, behaviour, and cognition. Think about when you last engaged in a case of reciprocal altruism and describe what took place. De Dreu, C. K. W., Baas, M., & Nijstad, B. A. (2008). Hedonic tone and activation level in the mood-creativity link: Toward a dual pathway to creativity model. Journal of Personality and Social Psychology, 94(5), 739–756. Isen, A. M. (2003). Positive affect as a source of human strength. In A psychology of human strengths: Fundamental questions and future directions for a positive psychology (pp. 179–195). Washington, DC: American Psychological Association. Kameda, T., Takezawa, M., & Hastie, R. (2003). The logic of social sharing: An evolutionary game analysis of adaptive norm development. Personality & Social Psychology Review, 7(1), 2–19..
Kameda, T., Takezawa, M., Tindale, R. S., & Smith, C. M. (2002). Social sharing and risk reduction: Exploring a computational algorithm for the psychology of windfall gains. Evolution & Human Behavior, 23(1), 11–33. Mealey, L., Daood, C., & Krage, M. (1996). Enhanced memory for faces of cheaters. Ethology & Sociobiology, 7(2), 119–128. Moreland, R. L., & Levine, J. M. (Eds.). (2006). Socialization in organizations and work groups. New York, NY: Psychology Press. Tooby, J., & Cosmides, L. (1992). The psychological foundations of culture. In J. H. Barkow & L. Cosmides (Eds. ), The adapted mind: Evolutionary psychology and the generation of culture (p. 666). New York, NY: Oxford University Press. Affect, Behavior, and Cognition by Dr. Rajiv Jhangiani and Dr. Hammond Tarry is licensed under a Creative Commons Attribution-NonCommercial-ShareAlike 4.0 International License, except where otherwise noted.